Germany, one of the largest exporters of high-tech marine and offshore equipment, has been a reliable partner of the worldwide shipping and offshore industry for many years. 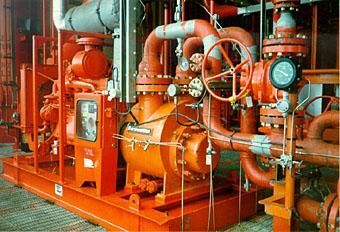 In the field of high sophisticated vessels and offshore systems the German equipment companies hold an especially strong position in the world market, not only for engines and propulsion, but also for deck machinery, pumping and processing systems, environmental technologies and in many other fields. The German marine and offshore equipment manufacturers with their wide range of manufacturing programmes are in a position to supply not only general but also sophisticated equipment of the respective sectors. Over many years, the research and development activities have been intensified in order to place numerous new developed products on the market. The special characteristic of the German equipment industry lies upon its capability to offer made-to-measure solutions at the highest technical standards and to guarantee an efficient worldwide after-sales-service. In 2003, the export rate of German marine equipment industries reached the high level of two-thirds of sales. For 2004, an even higher figure is expected. This gratifying performance is clear confirmation of the competitiveness of the mainly mid-sized German marine equipment suppliers in the international market. With some 70,000 employees, this sector generates sales of approximately Euro 8 billion and is a world leader for the export of high-tech systems for shipbuilding and one of the big players in the market of offshore equipment. Marine and Offshore Equipment Industries is a special division of the well known, non-profit organization VDMA (German Engineering Federation). This division represents the whole industry with the member companies from all branches, such as mechanical engineering as well as the electrical and electronics industries. Supporting worldwide customers in arranging contacts with efficient German marine and offshore equipment manufacturers. Intensifying mutual co-operation with engineering companies, yards and operators in technological as well as commercial fields. Fostering the free market principles in the world market by means of close contacts with various international organizations on one hand, on the other hand with the help of the national government. Enforcing the technical harmonisation through international standardization. Sponsoring important international exhibitions in the shipbuilding and offshore oil and gas sector. Different from the other big players, the German offshore equipment manufacturers have not been assisted by national orders since Germany has no remarkable domestic oil and gas market. The sector’s good performance was therefore achieved only thanks to companies’ own efforts in coming up with a wide range of innovations, expanding their worldwide service networks and taking full advantage of all opportunities for improving productivity. The continuing pressure on prices has forced yards and equipment suppliers to reconsider how much of their production they want to outsource – which could be both a challenge and an opportunity. We are forecasting a further rise in the value-added share of production accounted for by suppliers. This trend is also being accelerated by customers’ requirements for more “package solutions”, “product-related services” and “tailor-made service concepts”. 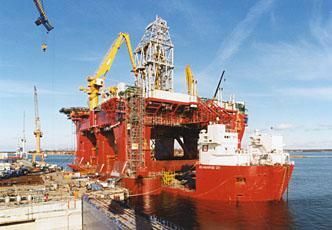 German marine and offshore equipment manufacturers are therefore stepping up their cooperation with the final operators as well as other suppliers to contribute their entire problem-solving expertise at the earliest possible stage in projects and provide the appropriate service concepts covering entire lifecycles. To sum up, German suppliers are successfully confronting the challenges of the world market, dominated as it is by increasing requirements for system expertise and service quality, as well as high-tech specialities developed and supplied at prices acceptable in the market. The German marine and offshore equipment suppliers are ready to meet these challenges and continue to see themselves in the shipbuilding sector as a driving force in technology and cost-efficiency. 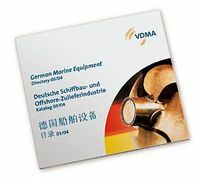 The Marine and Offshore Equipment Industries is a special division of the well-known non-profit organization VDMA (German Engineering Federation). This special group represents the whole industry with the member companies from all branches like mechanical engineering, electrical and electronic industry. (Fax +49-40-50 72 07-55, e-mail: nord@vdma.org).